First BlackBerry 10 device may launch on February 28 | BlackBerry Blast! The BlackBerry 10 launch event is set for January 30, but nobody has announced an availability date for the first BB10 device, until now. 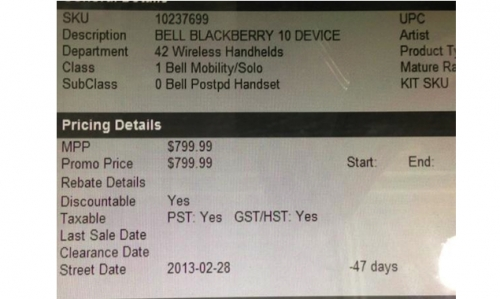 A leaked photo,, supposedly from a Best Buy in Canada seems to show a BB10 device launching on February 28 for $799.99. Late last year RIM's COO said in an interview that the BlackBerry 10 devices would be available within 30 days of the launch event. February 28 falls just 29 days after the launch date which would definitely fit in that time frame. Even though these reports are rumors at this point, February 28 is probably the date. Get ready for BB10!